28-Feb-2005 -- Within the next two hours we will arrive at the pilot embarkation point for the port of Wilhelmshaven, where our Egyptian potatoes will be discharged. Arriving from West we could just visit a German offshore, 54N 7E. These islands protect the mainland against onshore storms, which the local people here are calling “Der blanke Hans” (something like “the White John”). The North and Nortwest sides of most of the islands are protected by groynes and other sea defences. The islands have moderately high dunes and are separated from each other by navigable channels, and from the mainland by drying flats, in German called “Watt”, across which there are Watt channels (in German “Priele”), navigable by shallow draught boats at highwater. The islands and drying banks are part of the “National Park of Lower Saxony Watt Sea” (“Nationalpark Niedersächsisches Wattenmeer”) and large areas are designated nature reserves. All islands are very popular as holiday resorts. Due to a very specific climate prevailing here, the so-called “Reizklima” (stimulating climate), they are visited by many people suffering of pulmonary deseases, and much of them find relief and cure. The island closest to the confluence is Juist. The name of this island is properly pronounced similar to something between ‘Yeast’ and ‘Youst’, in German: Jüüst. But even many Germans, especially when from the South and not having much do to with this area, do not know how to pronounce it properly, so no problem. Juist is a long narrow island bordered by dunes which rise to a height of 20 metres. Buildings stand near the centre of the island, where there are several villages. Juist has an airport and according to British Admiralty Sailing Directions it is the only island of the East Frisian Islands to appear as a straight line in the radar. Let’s check it out on our radar: Yes, correct. Looking to SSE there is the next island, Norderney. Norderney (pronounce it similar to ‘Northern Eye’) is the largest of the East Frisian Islands and their principal holiday resort. The town of Norderney, in which there are a number of large buildings and where there is a small harbor stands at the West of the island. Nature reserves are situated in the South and East part. 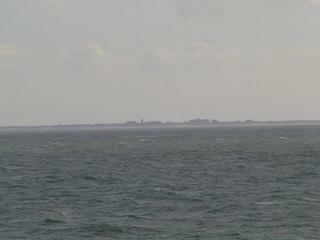 At its centre there is Norderney Light, a tower 54 metres (177 ft) high. To the SW, where the islands of Borkum and Memmert are located, we could unfortunately see nothing, as the sun was shining too brightly and reflecting on the Sea. The people living in this Nortwestern tip of Germany are called East Frisians (in German Ostfriesen). They have their own culture, history and language, which differs so much from German, that it can no longer be understood by others than Frisians. In Germany it is believed fully unjustifiedly, that East Frisians are simple minded people, and a lot of ugly and spiteful “jokes” about them do circulate. I, however, do know a lot of Frisians. They are strongly engaged in shipping business. A lot of shipowners are based in Leer, Haren/Ems, or Papenburg. Our present charterer e.g. is from Leer, a major town of East Frisia. And they are absolutely not simple minded! An East Frisian merchant can be smarter and tougher then a distinguished pin-stripe suit broker from Hamburg or Bremen. They are just reserved people, they do not talk much, and this fact has been attributed to dullness. In fact, they are witty people, once you know them better, and I have had many unforgettable hours in East Frisian ports with a lot of fun. The German is on summer holidays in East Frisia. Of course, as usual it is stormy, rainy, cold and humid weather. Then the extremely disappointed and highly annoyed tourist meets an old Frisian fisherman, sitting comfortably in front of his house and repairing his nets. As it is customary in East Frisia, you do not get an immediate reply, an East Frisian is first thinking thoroughly prior talking. After a five minutes or so the fisherman replies in Lower German dialect: “Vörig Joor wer t’n Dunderstach!” (Last year it has been on a Thursday). Finally at 5 p.m. the pilot for Wilhelmshaven arrived with his small boat and boarded our ship. There is a Navy Museum where amongst other things an old Minesweeper and the U-Boot S189 can be visited.